Aren't they lovely? I have decided that this blog will not become a wedding blog over the next year. However, how could I resist posting these photos. This was the wonderful box that awaited my arrival home from work on Tuesday evening. I cannot begin to convey the shock of finding these treats at my door step. Aren't they beautiful? Let me tell you that they are equally as delicious to eat. So here I sit watching the Biggest Loser on TV and thoroughly enjoying the strawberries. I will mention that they were sent anonymously. Whoever you are out there, THANK YOU! As I mentioned in my last post things have been quite hectic in my life lately. I am traveling non-stop and if you remember my post a few months ago and traveling you will remember that I do not cook when I travel. Thus for as long as I can remember now I have been eating out quite a lot. It is fun at time but can get quite old as well. 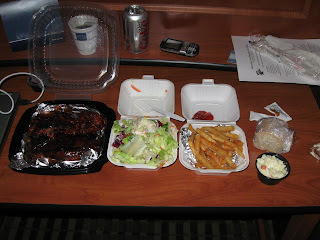 Thus I must share with you some photos of food Jordan got the other night when he was traveling by himself. For those of you wondering, yes, he does have a very strong stomach. The boy never gets sick from food. Good thing I guess when he eats like this. Anyway this is the best I could manage for a period on non-cooking for me. Doesn't it make you want to go out to eat? This book seems even more fitting now that I am engaged. Hence the lack of posts. I have been extremely busy the last two weeks, not to mention out of town most days. I got this book as a Christmas present though and it is by far one of my favorite books. This books is about an engaged couple living together the year up to their wedding. It goes through the different adaptations one has to face when co-habitating with your significant other. How does your life have to change? What really is compromise? Most of the anecdotes though deal with food. For me they eerily familiar. Each chapter ends with a recipe which has meaning to the chapter. Utterly delightful is all I can say. Go check it out! It is only 200 pages so its not that much of commitment! 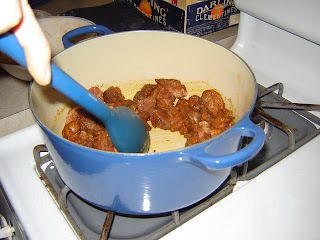 Way back when we purchased are gigantic duck to roast we also picked up some venison stew meat. I could not remember if I had ever had venison before. I was a bit leery since my most recent recollection of stew game meat was some caribou Jordan's grandfather hunted. I won't go into details but to me the apartment smelled like animal for about 3 days so you can only imagine what I thought it tasted like. Thankfully I really enjoyed the venison. After some diligent Internet searching I ended up using the Emeril Lagasse recipe below. In a large pot, over high heat, add the olive oil. In a mixing bowl, toss the venison with flour and Essence. When the oil is hot, sear the meat for 2 to 3 minutes, stirring occasionally. Add the onions and saute for 2 minutes. 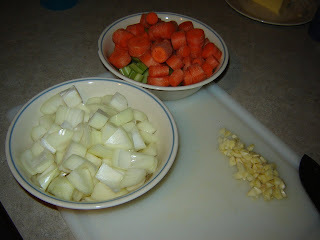 Add the celery and carrots. Season with salt and pepper. Saute for 2 minutes. Add the garlic, tomatoes, basil, thyme, and bay leaves to the pan. Season with salt and pepper. Deglaze the pan with the red wine. Add the brown stock. Bring the liquid up to a boil, cover and reduce to a simmer. 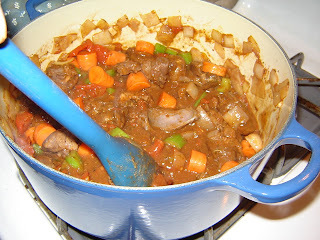 Simmer the stew for 45 minutes to 1 hour, or until the meat is very tender. If the liquid evaporates too much add a little more stock. 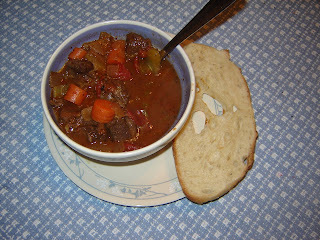 Remove the stew from the oven and serve in shallow bowls with crusty bread. Let me tell you the Essence is something to talk about. Very good but very spicy. We cut back on the Paprika and Cayenne. I was still sniffling away as I ate. 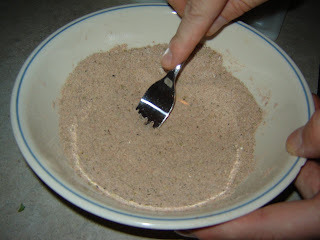 I would recommend separating the mixture a bit and then adding more to fully coat the meat if needed. 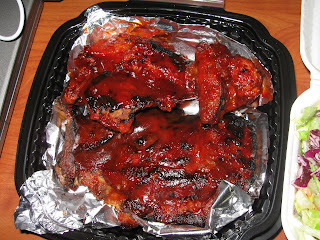 I ended up throwing a lot of it away after the raw meat had been toss. There are some things you just cannot get anywhere else. A massive one pound sandwich is mostly likely found only in New York Jewish deli. Enter the "Woody Allen special" 1/2 pastrami and 1/2 corned beef sandwich that only Jordan could truly be impressed with. Yes, the only pictures I could take were with Jordan's mouth full, but check out that stack of meat. Not only did he only eat half during the meal. The left overs were spread across another normal size sandwich and then a huge helping of homemade hash for breakfast the following day. Three meals out of one sandwich - it makes the $20 price well worth it. OK I might be a little over dramatic with that statement, but one of the most frustrating things for me when making dinner is not having things come out at the same time. This sounds like an amateur move I know but when you follow directions and plan things accordingly and still the one thing is not done. Really, what do you do? In my case Saturday night dinner was a two course meal. First course, new potatoes and steam broccoli. Second course, roasted chicken. Urg! In goes in the roaster with the special pop-up bottom. I checked the weight, consulted the ever useful Joy of Cooking to get the correct minutes per pound time frame and in goes the chicken. Well I started the potatoes and broccoli to be done when the chicken was suppose to be done and low and behold the pop-up button had not popped up. I am normally a fan of these little pop-up gadgets. You don't have to mess with a thermometer. I know sometimes they can be faulty so when the time came for the chicken to be done and the pop-up was still down I took the chicken out and flicked the skin around the button. (Sometimes I swear they just get stuck and this works) It remained down so in goes the chicken once more. Another 25 minutes later the pop-button finally popped. So that was our not so enjoyable two course meal.